You too can be the envy of the entire car show with this single product. It's a no-brainer, and with an simple install, you can improve the look of your Corvette. 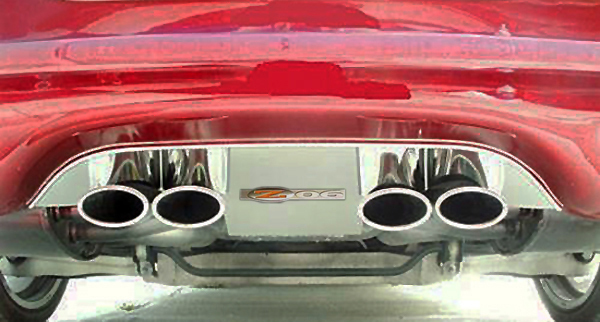 Mirror-polished stainless panel fills entire C5 Corvette open exhaust area - not just the "black" hole between the tips. Rear exhaust port filler panels wrap over the entire stock exhaust and installs in a few minutes with minimal tools and hardware. 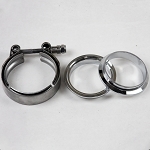 Manufactured from 20-gauge 304 stainless steel with a polished finish that will last a lifetime; no pitting, rusting, fading, chipping, or peeling like you will most likely find with most other chrome-type accessories. Designed to fit all 1997-2004 Corvettes with stock exhaust. 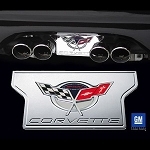 Includes pre-installed factory C5 Corvette emblem. Made in the USA. GM Licensed.